Cruise control is an automatic control speed, which is set by the driver at a required speed for a car to maintain a speed automatically on the road, After sett the speed this system takes over the throttle by using a sensor system on the car. In Pakistan people less familiar or completely don’t know about the cruise control, those who know about the cruise control only know as an auto speed setter, which allows the driver to pull off his feet from the acceleration pedal, but there is a lot more than this, which will be discussed in detail including the top cruise control cars in Pakistan. 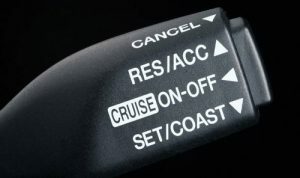 Cruise control has a memory feature to resume the set speed after braking, and a coast feature to reduce the set speed without braking. When the cruise control is engaged, the throttle can still be used to accelerate the car, but once the pedal is released the car will then slow down until it reaches the previously set speed. Standard cruise control only provides the driver to let his feet out of the acceleration pedal by sett a speed at a limited speed. Adaptive cruise control comes with latest vehicles for the electric throttle system which integrated with the vehicle electrical management system, this adaptive cruise control system has the ability to reduce a speed in case of a car to close to his car (pre Collison warning system), Automatically braking system in the adaptive cruise control allow the vehicle to brake in case of any live object ahead, Lane departure alert and Lane keeping assist, Blind spot warning. Adaptive cruise control use one of them from radar scanner, Front parking sensors or front camera for this. In Pakistan not many cars offer cruise control as a standard feature, you have to add it extra to get benefit of it, Only limited cars offer adaptive cruise control in Pakistan, the list is here below. Honda Accord 2018, Toyota Camry Hybrid, Toyota Land Cruiser and Prado have adaptive cruise control with below standard safety features. Toyota corolla 1.8, Toyota Grande 1.6, Toyota Prius, Toyota Fortunar, Toyota Revo, Honda Civic 1.8 and 1.5 turbo, Honda Vezel, Suzuki Vitara, have conventional cruise control system as an optional. These are the top cruise control cars in Pakistan with the latest knowledge of cruise control technology. Want to read more about Cruise control.. Click it..